1869 – Minnie Cox, the first Black postmistress in U.S. was born in Lexington, Mississippi. 1894 – Willis Johnson patented a device now known as the Egg Beater. For more information on Willis Johnson, see his profile on blackinventor.com. 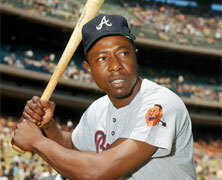 Henry “Hank” Aaron was born on born February 5, 1934, in Mobile, Alabama. Aaron would become one of the greatest players in Major League baseball history but his greatest moment came when he broke the home run record of Babe Ruth on On April 8, 1974. He would eventually be named to the Baseball Hall of Fame on August 1, 1982. For more information on Aaron, see his profile on greatblackheroes.com. Singer Natalie Cole, daughter of legendary singer Nat Cole, born in Los Angeles, California. Singing professionally at age 11, by 1976 Cole had won Grammys for New Artist of the Year and Best R&B Female Vocalist. 1994 – Avowed White supremacist Byron de la Beckwith is convicted of the murder of civil rights leader Medger Evers. The conviction occurred more than thirty years de la Beckwith shot Evers in the back in Mississippi.